Is there any other way? I never thought so, but now I know differently. Somestimes I find myself not breathing at all…or even worse too many breaths at once leading to a sense of panic. 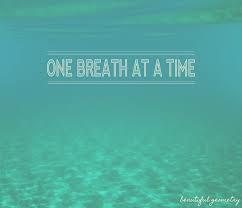 One day at a time, moment to moment, one breath at a time. That is what I am told. I guess that is all I have right now. It’s hard to think or plan too far ahead because I don’t know what’s coming next. I know there is no way to control life, and trying to control everything is a bad way to live, but a little sense of control brings security and right now I have neither, In reality we never do. We don’t now what tomorrow is going to bring, so we carry on as if we have forever doing our day-to-day business of life. Sometimes that business is meaningless, or pointless. Trying to get more money, more things…for what? We run around trying to have more and forget about what is truly important…happiness. Whatever that means to you. Why wait until you retire, or the kids are grown, or you have X amount of money, or whatever…that day may not come. We have to live for today…today. We hear this all the time, but how many of us actually embrace this? Life keeps moving on no matter how we spend our time. I want to spend it right…My husband, my boys, my family, my friends…peace, love. That is what matters. Being happy where I am in the moment. I have always had trouble doing this, but now is the time to change this. Take a risk, do what I dream, no looking back, no regrets. Fear is the only obstacle in my way. No more. I am going to take each moment one breath at a time. Remembering to breathe and take the moment in. I may not have control over all this that is happening right now, but I have control over my thoughts; control over my breathing. When I start to panic or lose control over the moment, I will breath in and out and take the moment for what it is…One bump in this journey of life. This moment will be gone too soon and we will be on to another. There is truly nothing I can do to change the place I am in at this time, but living the moment right will be a step in the right direction…and eventually, with great positivity, we will continue towards our happiness in a new-found sense of freedom, and love. Previous Post Hey Cancer…Watch your back! BIG hugs to you. Your are stronger than you give yourself credit for.